Katie Tibaldi is a writer, director and producer born and raised in Michigan. She also has the distinction of being childhood best friends with the host, April Wolfe! Between working on shows such as Broad City, Nurse Jackie and Damages, Katie's already worked on over 300 episodes of television. She’s currently producing the documentary feature Street Fighting Men, which will be distributed by First Run Features later this year. Her work on that made her a 2016 Sundance Institute Doc Fellow. She’s also Co-Producer on truTV's Emmy-Nominated comedy series 'At Home With Amy Sedaris.' She recently directed the independent half-hour comedy pilot 'Ian Owes U' that had its world premiere at the New York Television Festival in July. She is also the writer, director and executive producer of 'Seeking Sublet,' a comedy series with 9 full episodes debuting later this year. The series has been showcased by MovieMaker Magazine, Script Magazine, Tumblr and Funny or Die. You can watch 'At Home with Amy Sedaris' on truTV in theaters now. 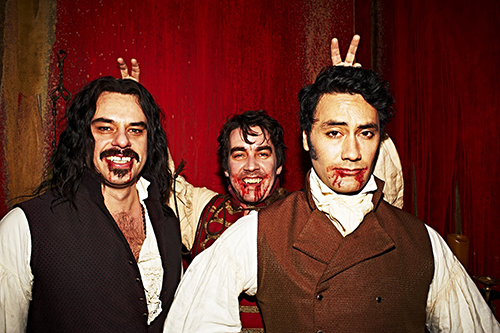 If you haven't seen it yet, go watch What We Do in the Shadows. With April Wolfe and Katie Tibaldi.